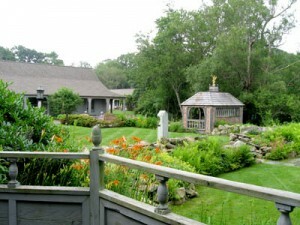 The English garden at St. Mary’s Church is a Cape Cod tourist destination. Perhaps it was the fact that the Pope spent a few days recently in England that made me think of this summer when I visited St. Mary’s Episcopal Church in the village of Barnstable, Massachusetts, on Cape Cod. I kept seeing notices in the tourist information that the Church had an old English garden. I had to see the garden. In 1946 the Reverend Robert Wood Nicholson began the garden which surrounds the stone church. Actually, it is a series of gardens with wood bridges and brick pathways, and even a gazebo. Beautiful stonework everywhere. The garden is well maintained and includes a rock garden, herb garden, a meadow, a pond, and many native plants. So what makes this an English garden? That was my question. Perhaps it is the ‘quaintness’ of the garden design. It is small, but quit welcoming. The garden is certainly worth seeing.